This entry was posted in Bathroom Remodeling Hanover Bathroom Remodeling York Bathroom Remodeling and tagged Bathroom Remodeling Bathroom Remodeling Contractor Hanover Bathroom Remodeling on June 25, 2014 by Matthew Smith. Bathroom remodeling in our area can be a little tough if you are looking for something modern. Homes in the Hanover, PA and surrounding areas typically have a little age on them and the trend of large, open, naturally lit bathrooms is a rather new one. So what to do? Creating ideas for your space is something that takes creativity, research and a contractor that really knows the area and its construction trends. Transforming the tight bathrooms that are so standard to our community into a space that is comfortable, useable and aligns with current trends often requires more than just replacing some fixtures, tub, toilet and flooring. Below you will find some suggestions and practices that we use when encountering these challenges in a bathroom remodeling project. Closed door closets and cabinet style vanities are a small bathrooms worst enemy. In a space that is already cramped they simply create the illusion of feeling even more cramped! Opening these spaces and picking the right storage accessories is paramount is making the space feel larger. To the right you will see a perfect example of this. 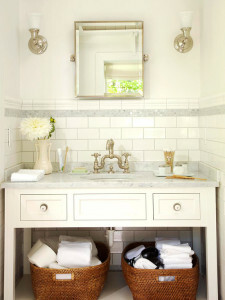 A nice open vanity with storage baskets and small drawers can really make a big difference! Cabinet doors would have closed this space off and it would have felt much smaller! 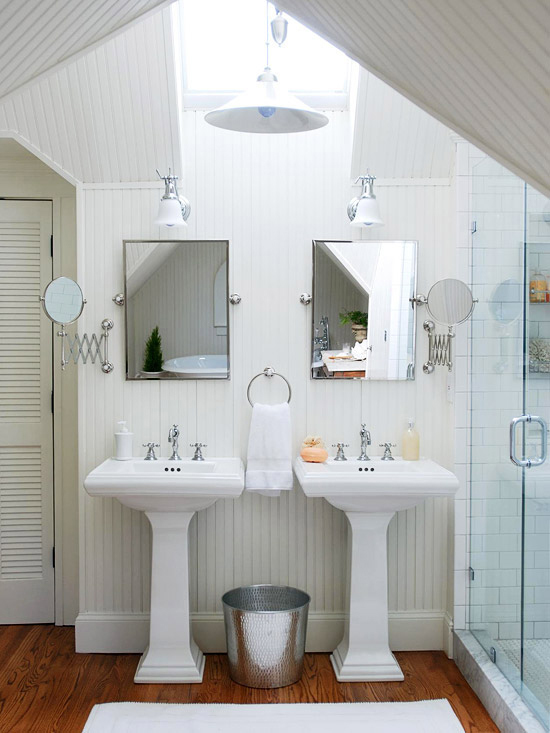 Of course there is always the option to go with a pedestal sink and a space saving, oversized medicine cabinet/mirror. This option will always open up a bathroom but you will need to find an alternate storage area for larger things like toilet paper and towels. Next thing to tackle is that larger storage area. Another big issue with homes in the Hanover, PA and surrounding areas is that a lot of the homes only have one bathroom. If you have a family, you know that the design featured above does not even begin to accommodate the amount of storage needed for a family. The typical solution widely seen is a linen closet, but like I said above, this closes off the room and can really cramp the style. A great solution to this dilemma is to have a carpenter build in storage and / or add shelving over the toilet. These two tricks add a bunch of character to a space, as well as create the needed storage that is needed. Check out the two images below for an example of what I am talking about. This is one thing that can’t be overlooked! If you have it in the budget, put in a skylight! Every possible way to increase natural light will really make a small bathroom come to life! 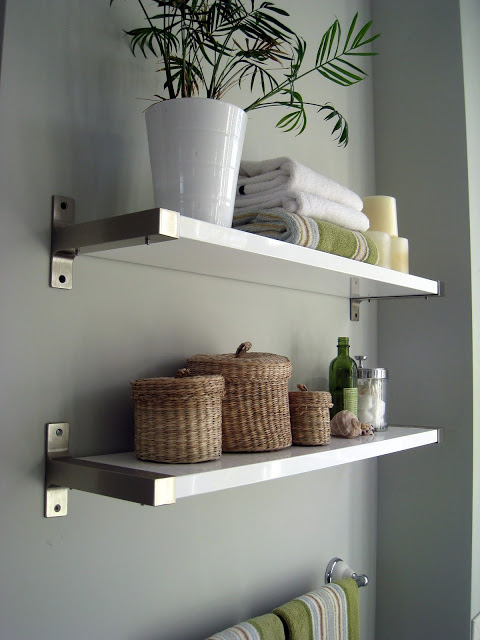 If you have a bathroom with no exposure to an exterior wall, add fixtures and get creative. If you took my suggestion from above with the custom shelving, have the carpenter install some fun lighting into the shelving. Illuminate every possible corner of the bathroom. After adding as much lighting as possible add mirrors! Mirrors will reflect this light and brighten it up some more! It should probably be mentioned that you do not want this to be hard light though. Soft lighting can go a long way in making your bathroom feel like it is just a little bit bigger! Check out the example from below. If you are looking to update a bathroom chances are you have probably gone online and looked at amazing bathrooms with the tub separate from the shower. While this is becoming almost standard practice in new home construction, it is probably not going to be an option in a small bathroom. As always you have assess you own personal needs, but if you don’t use a bathtub, why have one? 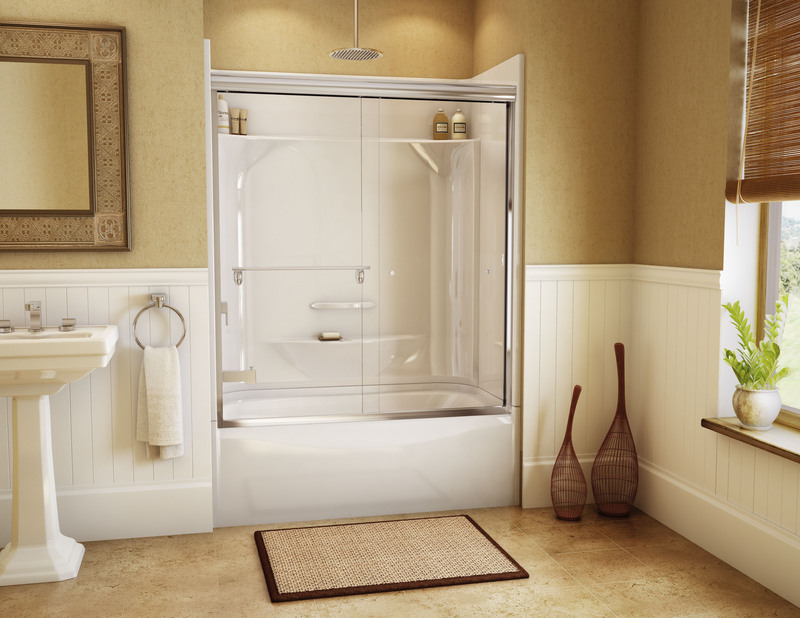 Replacing a standard tub/shower combo with a glass door standing shower is going to really open up the space! Of course if you do still need the tub, think about adding a glass door instead of the standard curtain. Either way you end up with a much more open and modern look to your new bathroom!